Meteren, France. 6 March 1918. 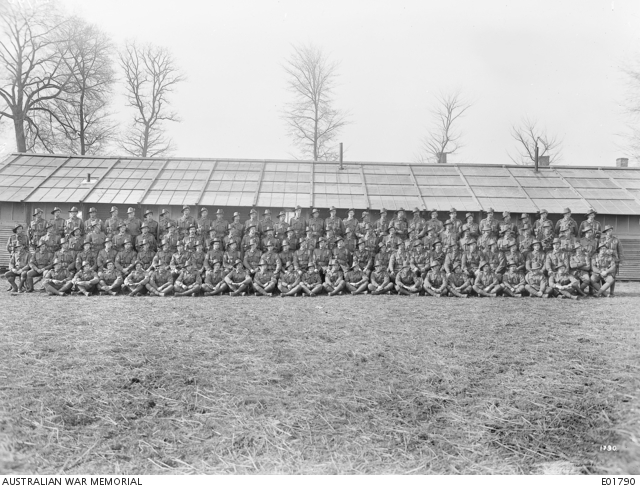 Group portrait of the NCOs of the 45th Battalion. Left to right, back row: 4346 Lance Corporal (LCpl) W. Warner MM; 2924 LCpl W. Hammond; 4170 LCpl J. W. Graves; 1903 LCpl R. Davidson; 2996 LCpl T. J. West; 4197 LCpl M. J. McCarron; 4017 LCpl J. Caughey; 3689 LCpl W. Bond; 3607 LCpl R. Rothwell; 3883 LCpl P. C. Page; 5381 Corporal (Cpl) A. C. R. Hill; 4475 LCpl P. F. Salmon MM; 3005 Cpl J. T. Allman MM; 4562 LCpl B. D. McGrath MM; 2153 Cpl E. E. Moseley; 1661 Cpl G. E. Botting; 1696 Cpl S. McGregor MM: 2520 Cpl R. George; 13158 Cpl R. P. Cairnduff (killed in action 17 August 1918); 408 Cpl F. Levick MM; 2913 Cpl J. E. Golden DCM; 2888 Cpl L. R. Corbett; 2931 Cpl G. H. Knox; 1703 Cpl E. A. Barker; 608 Cpl R. W. Freeman; 1836 Cpl G. A. Homphreys; 5153 LCpl Mitchell; 4555 LCpl W. E. Bookless; 4812 LCpl A. E. Irwin; 4731 LCpl W. R. Baker; 4596 LCpl W. R. C. K. Lewis MM; 3204 LCpl R. V. M. Murray. Third row: 2965 Cpl A. H. Bricknell; 1330 Cpl P. J. Considine; 2409 Cpl A. Denham; 1717 Cpl S. H. Horton MM; 3253 Cpl W. Tozer; 3948 Cpl A. Venables MM; 2010 Cpl J. V. Thompson; 3941 Cpl H. Sawden; 1875 Sergeant (Sgt) T. Aylward; 4444 Sgt D. Hand; 3888 Sgt W. A. Price; 2942 Sgt C. Walters; 371 Sgt W. Doig MM; 1334 Sgt J. Turner; 2181 Sgt G. A. Kelly MM; 506 Sgt A. D. Garred MM: 3314 Sgt C. R. Fowler; 2573 Sgt R. T. Cole; 4180 Cpl A. Erickson; 1873 Cpl C. E. Lee; 2182 Sgt J. V. Gosper DCM; 4517 Cpl R. Morgan MM; 3801 Cpl F. G. Harris; 2452 Cpl R. A. Walker MM; 3515 Cpl J. Wilson; 7472 Cpl V. J. Bean; 5354 Cpl G. D. R. Craig MM; 1835 Cpl M. T. Scott; 5335 Cpl W. F. Blanks. Second row: 2150 LCpl L. D. Clancy MM; 1885 Sgt V. H. Browne; 1678 Sgt W. D. Bull MM; 1548 Sgt J. Godman; 1612 Sgt A. J. Craig; 3888 Sgt A. Potte; 3805 Sgt F. H. Hazelwood MM; 1133 Sgt C. Schade MM; 2829A Company Quartermaster Sergeant (CQMS) K. B. Goodwin; 4465 CQMS G. P. S. Parke; 2788 CQMS K. R. Brent; Company Sergeant Major (CSM) J. Bromwich; 4489 Sgt E. L. Bailey MM; 4776 Sgt M. D. Free; 3358 Sgt A. J. Kearney MM; 3982 CSM A. N. Chew; 2337 CSM J. Bradford DCM; 2420 Regimental Quartermaster Sergeant (RQMS) T. McKinley MSM; 4190 Staff Sergeant (SSgt) W. G. Giles; 4477 Sgt C. Smith DCM; 2357 Sgt E. A. Cullen; 4445 Sgt N. J. Hansen; 967 Sgt A. J. Robinson; 2410 Sgt H. Manuel MM; 1714 Sgt D. Chisholm; 1702 Sgt A. M. Mills; 2676 Sgt G. P. Pooley; 984 Sgt R. A. Coombes MM; 1059 Sgt W. Alabaster MM; 1591 Cpl L. Pont; 1667 Cpl D. Gallivan. Front row: 4497 Cpl R. Crowl; 1898 LCpl W. I. Coles; 3449 LCpl A. F. Richie; 1861 Cpl C. D. Mossop; 5335 Cpl T. Chamberlain MM; 3120 LCpl R. E. King; 1409 LCpl F. C. Squires MM; 1912 Pte W. Bannister DCM; 3140 LCpl W. J. Wills; 3364 LCpl W. Looling MM; 3354 LCpl R. Barten; 1635 LCpl F. J. Ogle; 3336 LCpl H. J. Hocking MM; 2957 LCpl D. McNeil MM; 1852 LCpl F. J. Kammel MM; unidentified; 3772A LCpl J. H. Lipman; 1633 LCpl W. J. Riley; 3225 Cpl R. Seers; 2907 LCpl W. J. Clarke MM; 1671 LCpl E. M. Scott.